Under this broader definition, the earliest known sharks date back to more than 420 million years ago. Acanthodians are often referred to as "spiny sharks"; though they are not part of Chondrichthyes proper, they are a paraphyletic assemblage leading to cartilaginous fish as a whole. Since then, sharks have diversified into over 500 species. They range in size from the small dwarf lanternshark (Etmopterus perryi), a deep sea species of only 17 centimetres (6.7 in) in length, to the whale shark (Rhincodon typus), the largest fish in the world, which reaches approximately 12 metres (40 ft) in length. Sharks are found in all seas and are common to depths of 2,000 metres (6,600 ft). They generally do not live in freshwater although there are a few known exceptions, such as the bull shark and the river shark, which can survive and be found in both seawater and freshwater. Sharks have a covering of dermal denticles that protects their skin from damage and parasites in addition to improving their fluid dynamics. They have numerous sets of replaceable teeth. Evidence for the existence of sharks dates from the Ordovician period, 450–420 million years ago, before land vertebrates existed and before many plants had colonized the continents. Only scales have been recovered from the first sharks and not all paleontologists agree that these are from true sharks, suspecting that these scales are actually those of thelodont agnathans. The oldest generally accepted shark scales are from about 420 million years ago, in the Silurian period. The first sharks looked very different from modern sharks. At this time the most common shark tooth is the cladodont, a style of thin tooth with three tines like a trident, apparently to help catch fish. 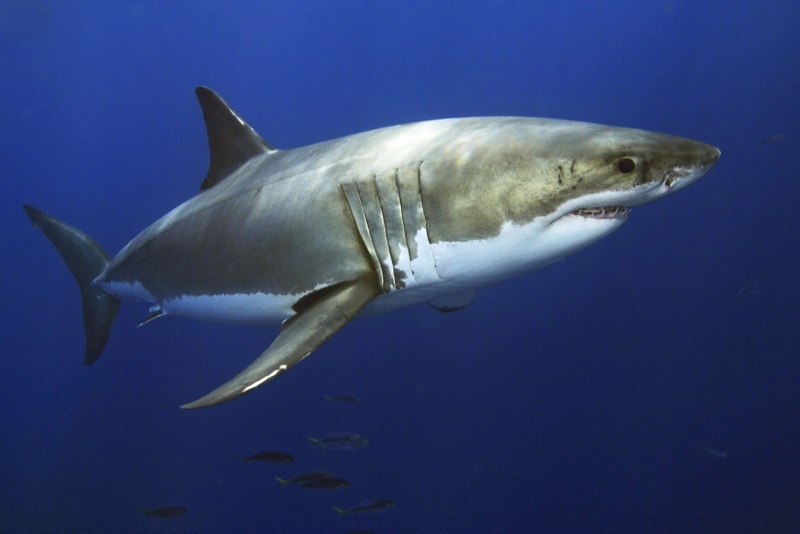 The majority of modern sharks can be traced back to around 100 million years ago. Most fossils are of teeth, often in large numbers. Partial skeletons and even complete fossilized remains have been discovered. Estimates suggest that sharks grow tens of thousands of teeth over a lifetime, which explains the abundant fossils. The teeth consist of easily fossilized calcium phosphate, an apatite. When a shark dies, the decomposing skeleton breaks up, scattering the apatite prisms. Preservation requires rapid burial in bottom sediments. Most fossil sharks from about 300 to 150 million years ago can be assigned to one of two groups. The Xenacanthida was almost exclusive to freshwater environments. By the time this group became extinct about 220 million years ago, they had spread worldwide. The other group, the hybodonts, appeared about 320 million years ago and lived mostly in the oceans, but also in freshwater. The results of a 2014 study of the gill structure of an unusually well-preserved 325 million year old fossil suggested that sharks are not "living fossils", but rather have evolved more extensively than previously thought over the hundreds of millions of years they have been around.